Crude Oil Daily: Worlds top 21 largest oil refineries. Notes: RIL's new refinery in the Special Economic Zone at Jamnagar is the world's sixth largest and has a Nelson Complexity Index of 14.0, making it one of the most complex refineries globally. The refinery has a capacity of processing 580,000 barrels of crude oil per stream day. With the commissioning of the new refinery in its SEZ, Jamnagar has now become the petroleum hub of the world. With 1.24 million barrels per day of nominal crude processing capacity (i.e., No. 6 Jamnagar + No. 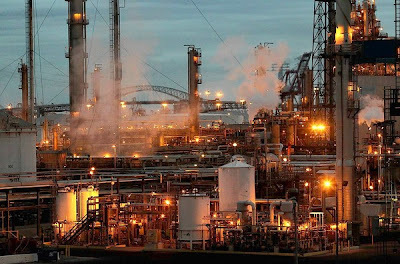 4 Jamnagar, above), it is the single largest refining complex in the world. This is equivalent to 1.6% [sic] of global capacity or one third of India’s capacity, and places RIL amongst the top ten private refiners globally. Please read RIL's website, here. For 2010, OGJ's survey shows total capacity at more than 88.2 million b/cd in 662 refineries, an increase of 1 million b/cd over the figure for 2009 of 87.2 million b/cd for 661 refineries. OGJ's refinery survey for 2008 listed a global capacity of 85.6 million b/cd in 655 refineries. – Please read Warren R. True and Leena Koottungal, "Global Capacity Growth Slows, But Asian Refineries Bustle," OGJ, Dec 6, 2010. South Korea is home to three of the ten largest crude oil refineries in the world – SK Energy's Ulsan (No. 2), GS Caltex's Yeosu (No. 3) and S-Oil's Onsan (No. 7). Source: Oil & Gas Journal, Dec 6, 2010.